Investigators were trying to determine Sunday whether skeletal remains found in Latimer County belong to a Eufaula family missing since 2009. The remains were discovered Saturday afternoon by hunters, said Gary Perkinson, assistant special agent in charge for the Oklahoma State Bureau of Investigation. “The area was very rugged and mountainous, making the search very difficult and time consuming,” he said. Investigators were able to access the area Sunday morning and identified the remains of two adults and one child. They were continuing to search the area Sunday afternoon for any possible evidence. “There was nothing at the scene to indicate the identity of the deceased, but we are looking at the possibility of these remains belonging to the Jamison family,” Perkinson said. 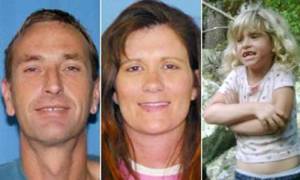 Bobby and Sherilyn Jamison and their 6-year-old daughter, Madyson, disappeared in October 2009 while looking for a plot of land for sale in the Sansbois Mountains in northern Latimer County. Eight days after they were last seen alive, Bobby Jamison's pickup was found abandoned at a well site. His wallet, Sherilyn Jamison's purse, a cellphone, a GPS unit, clothing and a bank bag stuffed with $32,000 were found in the pickup. The family dog was also in there, barely alive. Perkinson said the remains were found less than three miles from where the pickup was discovered. Police searched the area thoroughly after the pickup was found. Four separate searches were conducted involving hundreds of volunteers, horses, mules, all-terrain vehicles, 16 teams of cadaver dogs, helicopters and an unmanned drone. Perkinson said it would have been easy to miss the location in the fall of 2009 with heavy tree cover and falling leaves potentially obscuring the bodies. The Jamisons' case involved strange evidence and wild theories from friends and family. A family pastor told investigators the family was engaged in spiritual warfare, convinced three or four ghosts were inhabiting their lakeside Eufaula home. Graffiti on a storage container at the home talked of witchcraft. Israel Beuachamp, who was Latimer County sheriff at the time the family disappeared, said the family's paranoid state suggested they might have been involved in drugs, although no evidence could be found linking them to the drug trade. Both Bobby and Sherilyn Jamison lost weight before they disappeared. A security camera at their house showed them behaving strangely, stopping and staring at nothing, Beauchamp said. It will be left to the OSBI and Jesse James, the current Latimer County sheriff, to pick up the investigation.